Your gorgeous tiles simply will not look clean if the grout in between them is dirty and discolored. Really, the one difference between clean-looking tiles and disgusting-looking tiles is the condition of your grout. It doesn’t matter whether your tiles are in the bathroom, kitchen, or elsewhere: the grout between them always stains easily. In the kitchen, unavoidable cooking spills make it easy for unwanted materials to stain your grout. In the bathroom, soap, mold, and mildew work in tandem to discolor your grout. So are you are trying to make your tiled floors, walls, and counters clean? Always start with a thorough grout cleaning. Luckily for you, you can use this quick and easy method to remove pesky dirt and grime and make your tiled surfaces look good as new! 1) Begin by preparing the area. Locate the area that needs cleaning and spray the grout with hot water. Use a stiff bristle brush (like a used toothbrush) and scrub in a circular motion as you follow the grout line. This gets rid of the surface level dirt and grime. 2) Create a cleaning solution. Mix together two parts baking soda to one part hydrogen peroxide or vinegar to create a paste. If your tiles are coarse like marble, use water instead of vinegar because high acidity can stain the tiles themselves. If your tiles come in contact with grease (as they commonly do in the kitchen) add a few droplets of dish soap. 3) Apply the solution. Spread the paste onto the affected areas of grout and wait for about 10 to 15 minutes. This is an important step as it allows the cleaning solution to work its magic and work deep into the grout. 4) Scrub away. Use another stiff bristle brush to scrub through the grout lines and scrub off any remaining dirt and grime lifted up by the cleaning solution. 5) Rinse. Add a few drops of dish detergent to a cloth or sponge and use hot water to wash away the rest of the grout cleaner. This will rinse off the tiles and grout as well. 6) Admire your work. Step back and enjoy a clean grout to accompany your spotless tiles! Your grout should look good as new. There’s nothing wrong with using commercial grout cleaners or diluted bleach but be careful when choosing to use a store-bought product. They are usually very harsh and will erode your grout with regular use. Make sure you read the product instructions carefully! If you do not want to worry about dirty grout ever again, we suggest that you apply a grout sealer. A grout sealer will cover any pores in the grout which will prevent dirt and grime from entering and accumulating. Before applying the grout sealer, wait at least a day to ensure that the grout is completely dry. 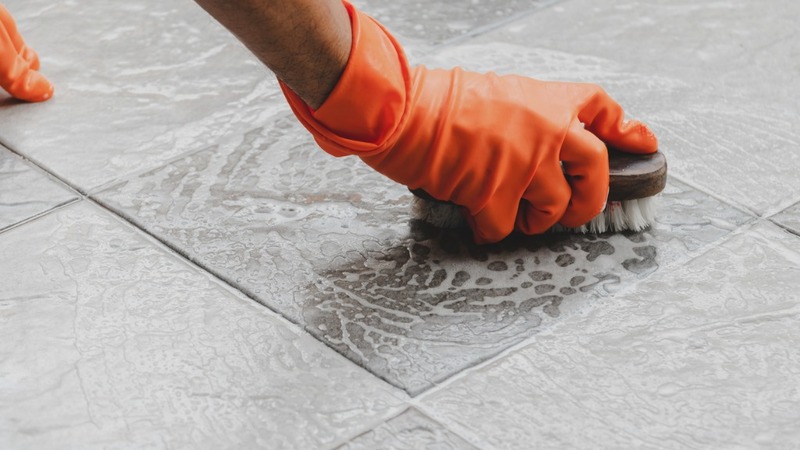 You won’t need to worry about discolored grout for a long time if you take this proactive step! Without the ugly grout discoloration to worry about, your tiles will look stunning and sparkly. You’ll be able to show off your beautiful and clean home with confidence. Thanks for reading and good luck cleaning your grout!